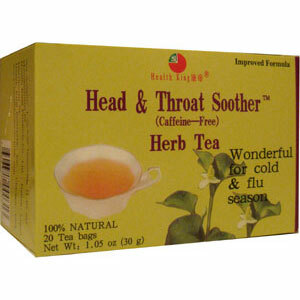 Head & Throat Soother Herb Tea (Caffeine-Free) is made of wild notopterygium, angelica dahurica and mint. They provide dihydroxy flavanone, methone, a-pinene, b-pinene, limonene, byak-angelicin, mint oil, etc. Chinese medicine uses them to remove heat and maintain normal nasal and respiratory functions. It is an ideal drink for cold and flu season.